Call Waiting Accept an incoming call while you are already on a phone call by placing the first call on hold and connecting to the other caller. Caller ID View the telephone number of the person who is calling you before you pick up the telephone. Plus, choose when you want to display your identity to those you are calling. Call Return Call the telephone number of the last incoming call without having to dial the number manually. Redial Connect with last person you called -- even if the line was busy or if the call was unanswered. 3-Way Calling Add a third person to an existing phone call so you can speak with two people simultaneously. Call Forwarding Forward all or select incoming calls to the telephone number of your choice (such as your home phone, cell phone, or office) or to VoiceMail. Call Blocking Determine the calls you receive by assigning telephone numbers to an "accept" or "reject" list and block anonymous calls. Account Balance Announcement A brief announcement before your call is connected tells you how much talk time you have remaining. 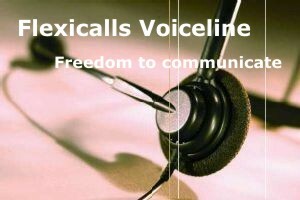 Language Selection Indicate your language preference for the Flexicalls Voiceline prompts and instructions that are played on the phone. * VoiceMail is free with any monthly calling plan. It is an optional feature with Pay-As-You-Go plan for $0.99 a month.